Riding high on the Christmas and New Year spirit, SocioLadder – A global technology driven platform for charity and fundraising is capturing hearts with its #findurstar initiative to support children in need. The initiative, enabled through a digital platform from December 23rd 2017, allows people from across the world to donate and make a difference to the lives of less fortunate children. 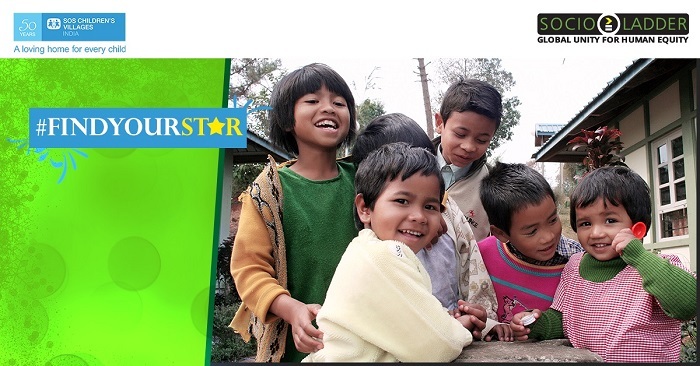 Through #findurstar, one can find their true stars in the children at SOS Children’s Villages of India and arbitrate a better future for these children by sponsoring their daily needs, education, health and nutrition along with other benefits which will help transform them into independent adults with an identity. Making it more viable to the donors, SocioLadder has also created options of monthly ECS payment starting from a mere sum of INR 900 per month. In return, donors will be connected to their beneficiary and have an account of every dollar/rupee spent through a unique tracking feature. Donations can be made online via – https://www.socioladder.com/findyourstar/.In addition, SocioLadder is also available as an android application letting people donate easily and also get updates on new projects by SocioLadder on their mobile phones. The biggest highlight of the campaign is the SocioLadder Rewards Program which comprises rewarding the donors with almost 100% returns on the amount donated in the form of benefits from Accor Plus, the most expansive travel and lifestyle program of Accor Hotels valid across the Asia Pacific region. Accor Hotels is a worldwide leader in the hospitality industry. They offer the largest brand portfolio across the global hotel industry. You’ll get up to 50% off dining, accommodation (as part of Red Hot Rooms), discount coupons (Applicable only in India) and more across the range of Accor hotels in Asia Pacific including Sofitel, Pullman, MGallery, Quay West, The Sebel, Grand Mercure, Novotel, Mercure, and Ibis as program benefits. SOS Children’s Villages of India (SOS India) is a global child care organization with over 53 years of committed experience in caring for once parentless and abandoned children. Today, it has impacted the lives of over 25,000 children by providing them with an identity, a family to call their own and has ensured they grow up to become contributing members of society. Its Family Based Care Program provides the children with a family home, a mother, loving brothers and sisters; and covers their education, health care needs, emotional support and holistic development. SOS India also helps strengthen families and communities as a preventive measure in the fight against child abandonment and social neglect with its Family Strengthening Program. What are you waiting for? Now that you know how to #findurstar, its time you do your bit to help others and of course earn good in return. You can also sign their pledge to show support to these causes for children and let these little stars at SOS India know that we care.The #findurstar initiative ends on 31st January 2018. Founded by Shravan Charya, SocioLadder is an IBM powered charity & social sector platform specializing in ease of donating with 100% transparency on impact measurement and beneficiary reporting. SocioLadder brings together individual donors, corporate donors and NGOs on their functionally rich solution platform. You can show your support by either donating or volunteering for their support and causes. SocioLadder is also associated with the following brands as: NSE – Strategic Partner, IBM Bluemix – Technology Partner, HDFC Bank – Banking Partner, UN Global Compact – Sustainability Partner, PayPal – Online Transaction Partner.